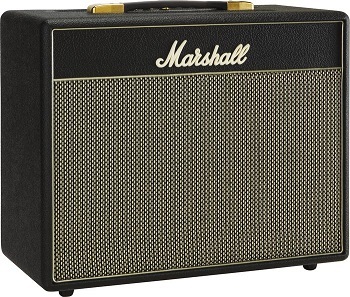 For under $500 you get all tube , England-made Marshall. Classic sounds, no frills and a well designed preamp channel that takes to pedals makes this a versatile little monster. With the current small wattage tube amp market there are a lot of choices, but none come close to the pedigree and quality of a traditional made in England Marshall. This little no frills combo comes with top loaded controls for Volume, Treble, Middle and Bass. If delivers class A tone, coming from two ECC83 preamp tubes and one EL84 power tube. The Class5 combo has one guitar input, an extension speaker output and a headphone output which can also mute the speaker. This is a single channel amplifier, with no footswtich or effects loop. The speaker is a 10” 16-ohm Celestion G10F-15 rated at 15 watts. The Class5 amp is also available in a head and open back cabinet configuration for those that feel the combo is a bit heavy (it is) at 26lbs. Looking at this amp and seeing it rated at 5 watts, I honestly wasn't expecting much in terms of power. Boy, was I wrong! Even at low volume settings it turned out that this amp still felt very responsive, and when pushed it gets downright loud! I can say that this is probably the loudest 5 watt amp that I've heard. Probably the class A design has something to do with it, but this little combo can definitely breathe some fire! Marshall compares this amp in design and type to the Bluesbreaker. Being unfamiliar with the sought after original, I found the Class5 similar in sound with the Plexi – just clean pushed pure class A power. At 5 watts this is a great amp to record. Moving everything to 11 delivered very serious crunch and bite, which when coupled with an overdrive in front (Boss SD-1) got comfortably in metal territory. There is something that has to be said for no frills amp designs, and this amp is definitely a perfect specimen for those players that like to control things from the guitar. It responds great to dynamics, and it can cut over a drum kit in most live situations. The Celestion 10 inch speaker that is packed in this combo works great and is very well voiced, and surprisingly deep in low end detail for its size. The Class5 is made in England and the workmanship is amazing, as it feels and sounds like Marshall's more expensive tube offerings. I would honestly be hard pressed to find a better sounding little amp for studio work. Lots of sheen for cleans and a great palette for a variety of tones. To me this little beast felt like a cheaper and more manageable Plexi, and for that alone I would probably want to have one in my arsenal. I hooked up the amp to an external speaker (2x12 loaded with 70 watt Celestion GT-12s)and it instantly felt like a much bigger amp. Again, I'd say that it was loud! I could see the lack of effects loop being a problem for some players, and the price for a 5 watt amp is definitely not cheap, but you get what you pay for – Marshall quality and sound. This would be a great amp to have on stage for a small club, but I believe in the studio it would be indispensable as it gets that Marshall tone for less, at lower volume and does it just as well as the bigger beasts.